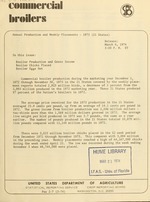 97 percent of the Nation's broilers in 1972.
lion pounds compared with 11,144 million pounds in 1972. November 3 when 48,744,000 were placed. with December of the previous year. 1/ Includes weeks ending December 2, 1972 through November 24, 1973. 2/ Includes weeks ending December 4, 1971 through Novermber 25, 1972.